Charles Manson Granted Parole, Will Be Released from Prison-Fiction! - Truth or Fiction? Charles Manson Granted Parole, Will Be Released from Prison-Fiction! Charles Manson has been granted parole and will be released from prison. 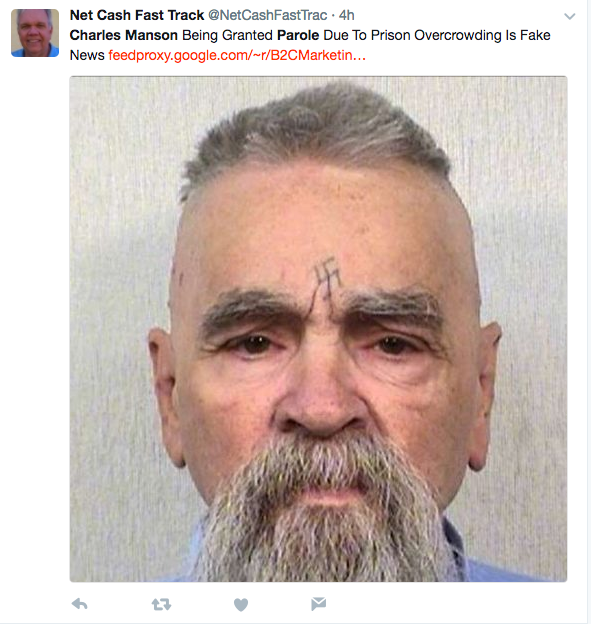 An old hoax about Charles Manson being paroled that was started by a known fake news website in June 2014 resurfaced in June 2017. The ruling, issued by three judges overseeing the state’s efforts to ease the overcrowding, gives California until February 2016 to achieve their goals. But, the judges said, the state has to make elderly inmates and those with serious illnesses eligible for parole immediately. Manson, who was denied parole in April of 2012 and wasn’t scheduled for another parole hearing until 2027, was re-evaluated due to his age and health and the Parole Board recommended his parole. The site’s disclaimer, however, states that it’s content is “intended for entertainment purposes only,” meaning that its reporting should not be taken as fact. It’s not clear why Charles Manson parole rumors resurfaced in June 2017. Manson was denied parole by the California Department of Corrections in 2012 and his next parole hearing was scheduled for 2027, when Manson would be 92 years old. In January 2017, however, Manson was transferred to a hospital for treatment of gastrointestinal bleeding, and Manson’s condition was described as “serious” by family members. He had been transferred back to prison by the time the rumor resurfaced. It’s possible that parole decisions regarding the release of other former Manson Family members could have contributed to Charles Manson parole rumors resurfacing. A panel recommended the release of a former Manson Family member named Bruce Davis who murdered musician Gary Hinman and stuntman Donald “Shorty” Shea in 1969. The final decision, however, will rest with California Gov. Jerry Brown, who had about five months to make a decision. the Los Angeles Times reports. Meanwhile, an appeals panel postponed a decision on wether or not to recommend the release of former Manson Family member Patricia Krenwinkel in December 2016, Fox News reports. Krenwinkel was present at the 1969 murder of Sharon Tate and four others. But regardless of developments with other members of the Manson Family, all Charles Manson parole rumors should be considered “fiction” until at least 2027, when his next hearing is scheduled. A false report that Charles Manson has been granted parole resurfaced in June 2017. ICE Raids Dozens of Convenience Stores in St. Louis-Truth!